After taking some time to photograph hosta leaves, this little spider popped out from behind a stem. I couldn’t figure out why the spider appeared carrying a soccer ball until I did some research. Turns out she is a Nursery Web Spider, appropriately named, who carries her egg case wherever she goes. I had to admire her facility moving through the leaves with no trouble. I imagined myself trying to carry an object half my size over hill and dale. 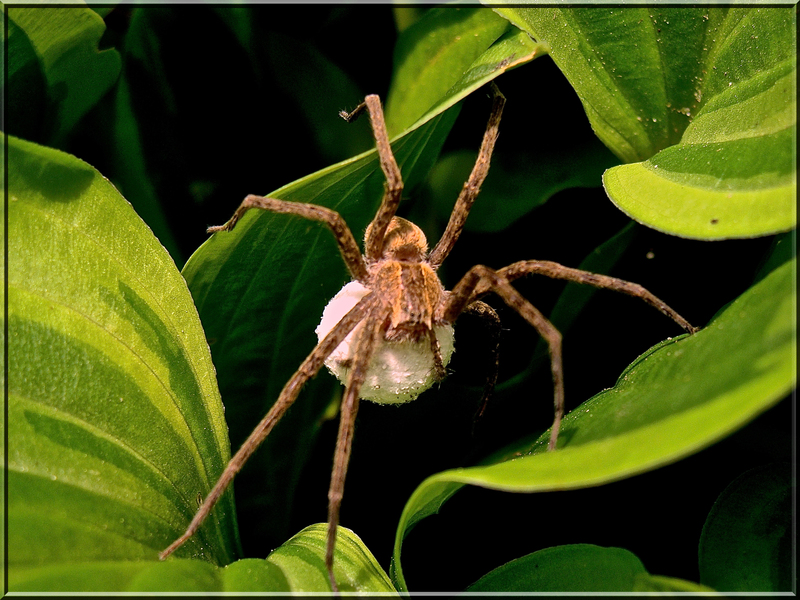 Eventually mommy spider builds a nursery tent for her egg sac when hatching time arrives and guards it protectively. Yes, probably some evolutionary advantage to carrying the egg case around. Such an effort but worth appreciating. How these creatures teach us wise lessons! If a woman were proportionately pregnant, she’d be enormous!!! Great catch. Evidently the spider carries the case with her fangs. Good thing we weren’t given fangs, too, cause they’d be enormous! lol. Thx for stopping by.